The original print version of the American Women research guide contained five topical essays, each exploring an aspect of women's history by analyzing resources held in different Library divisions. The purpose of these essays was to demonstrate for researchers how to identify collections relevant to a topic that are physically separated across the Library's twelve major reference centers. types of material–pictorial representations of American women before 1800. Many more topics and avenues of research await the staff's attention, and additional essays will be added in the future. For now, the original five essays are available together with historian Susan Ware's introduction to the book and a brief piece describing the 1780 broadside "The Sentiments of An American Woman," which graced the end papers of the print volume. When studying the lives of women throughout history, it is important to consider the questions that have not been asked: where are the women? how would the inclusion of womens experiences enrich interpretations of the past? and "why were the roles women played the subject of limited attention in, or omission from, particular historical discussions?" The traditional invisibility of women in history does not mean that they were absent from pivotal events or did not play important roles in their societies. Consider, for example, how warfare often has been represented in history books: a narrative of battles and military prowess. 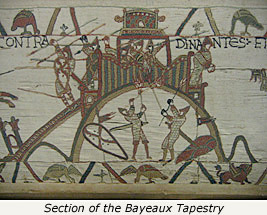 The visual record of war—from the narrative on the Royal Standard of Ur, through those on vases, wall frescos, mosaics, and illuminated manuscripts, to the Bayeaux Tapestries in France—is overwhelmingly one of men fighting men. In many traditional histories, the dates of wars bracket the beginnings and ends of different eras. As long as historians focus remained on fighting, the analysis of war centered on death and heroism, together with military hierarchies and strategies. Questions often raised in connection with war addressed issues of diplomatic, military, and political history. This interpretation of warfare is popularly reflected in the predominantly male figurative statues in memorials throughout North America and Europe. Women are only occasionally found, and those who are depicted are usually shown healing or mourning the dead. Women were more easily omitted from analysis of the fighting front because, until World War II, when significant numbers of women participated as soldiers in the Soviet Unions Red Army, they were only rarely found on or near the battlefield. 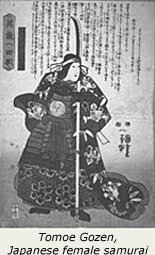 Occasionally mythological figures like the Amazon warriors of Ancient Greece or Tomoe Gozen, the Japanese female samurai, or exceptional real women—such as Joan of Arc, the 15th-century French heroine of the Hundred Years War against England—became part of war legend. In rare cases, lesser-known women donned mens clothing to participate in battle as males. Beyond that, only camp followers, and later nurses, would find places in this history. What happens, though, when we change the focus? When we consider war as having both a home front and a fighting front? Then the discussion of war expands to include not only womens varied wartime activities, but also the experiences of families, children, and noncombatant males. This approach permits examination of nonheroic accounts of the male experience of war, differing attitudes toward male and female collaboration and resistance, and postwar social continuity and change. Standard primary sources, such as government documents and newspapers, contain a wealth of material reflecting womens wartime experiences. These include accounts of civilian rationing and food supplies as well as statistics on birth, death, marriage, and divorce rates. Private sources, ranging from civilian letters to womens commentaries about life on the home front, in captivity, or in exile, also help us understand wartime in a broader framework. Taking into account class, cultural, gender, and racial aspects of wartime society expands our understanding of the reach of war. This example of how the history of war changes when we broaden our focus can be applied to any aspect of world history. When we take this broader view, women emerge from the shadows and become active and important players in our analysis of the past. Considering the place of women in world history does not simply expand our understanding of events, but reshapes that understanding. Therefore, it is important to think about women, and gender more broadly, as more than adding voices to the historical record. By investigating women in world history, we gain a new way to understand social relations at every level—the personal and the political, the local, the national, and even the international.